Silver Touch’s Warehouse Management System (SWMS) is a web based solution that has been developed specifically for SAP Business One. It allows you to take full advantage of your ERP investment by integrating a comprehensive warehousing solution suite. 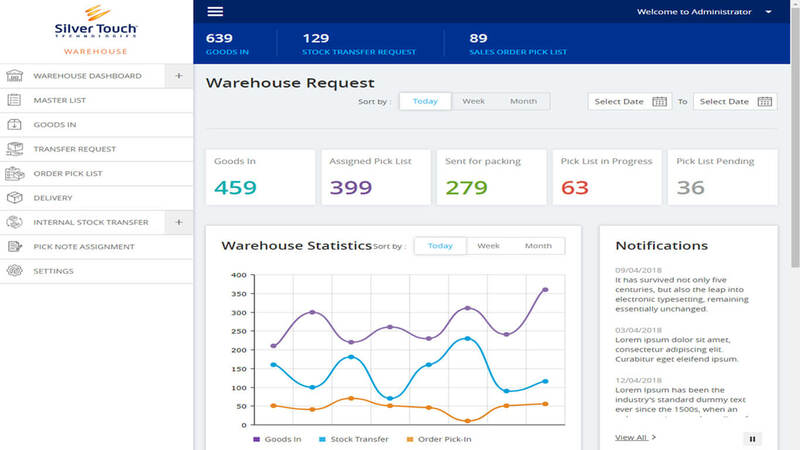 Small and midsized businesses are benefiting from improved efficiencies and reduced costs associated with their warehouse with the use of warehouse management software. Receiving goods based on Purchase orders/Customer returns/ASN. Put away into bin/storage locations using system. Using SAP Business One standard item master data, warehouses and bin location features. user will pick items row by row and update SAP data at the same time. Move stock from warehouse location to picking locations in order to maintain level of stocks. Picking client’s orders based on pick by order/ by customer/ by area / Multi order picks lists. Pack and Ship multiple orders. Create a delivery note or an A/R Invoice. Manage physical and cycle counting for a warehouse or bin location. The Pallet Master allows the user to predefine the size of pallets based on their delivery requirements. Based on the assignment, pickers will pick the orders and send them for packing. All operations performed is being updated in real time in SAP Business One. Silver Touch WMS add-on will be helpful to keep inventory operation simpler and easier. smartphones, to tablets and traditional warehouse scanners providing greater flexibility. Integrated business intelligence makes decision making process faster.